Western concert dance has long lived in a tension between two poles. On one hand, there’s classicism, codification and tradition. On the other, there’s originality, abstraction and rejection of tradition. Arch Contemporary Ballet has a very unique mission to marry ballet and music, in all overall shaking-up of ballet tradition. 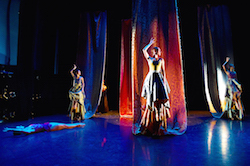 The company’s work, by choreographer and Artistic Director Sheena Annalise, works toward this goal with very innovative techniques, such as all-female partnering and live musicians performing right on stage with the dancers. Château, most recently performed at the Davenport Theatre in New York City, demonstrated agile facility with these techniques. Intriguingly, the work embodied and illustrated a very iconic and classical theme — that of the French noble court, its grandiose architecture and hierarchical social system — in fresh, innovative and fully modern ways. The first aspect of the choreography that caught my eye was the presence of contractions and releases, seemingly straight out of Graham technique. Through these, the dancers appeared to have spines of Silly-Putty – solid and strong, yet endlessly pliable and moldable. Somehow, Annalise managed to blend these types of contemporary-inspired movements with classical ballet technique, such that neither stuck out. It all just blended to be beautiful movement. Also subtle, yet totally readable, were movements of the French court’s physicality – curved fingers over the head, for instance, as if adjusting one’s wig or making a dramatic swooning gesture. The costumes also contributed to that understated, yet accessible, presentation of the French court through a blend of classical and modern styling. The bodices and skirts, for instance, were in lavish lace and elegantly draped, yet also had a pleasing Spartan simplicity. The choreography even engaged the costumes to reinforce the theme of architecture; at one point, two dancers raised their long skirt over their head behind them, to convey richly tapestried walls. The choreography successfully and compellingly called upon the dancers’ body to convey architecture at several other points, as well. As one, one dancer fell sideways – in a perfectly straight line from head to heels – into another beside her, remaining upright. The same construction occurred on the other half of the stage. It became a human Hall of Mirrors, one I almost wanted to step on stage to walk right through. Considering embodiment of the courts’ social strata, there were no evident narratives of any social interactions. On the other hand, certain emotions and relationships were evident. This included romantic relationships, or so they seemed, between the male and female dancers in a few lovelypas de deux. At times, the male dancers’ physical energy and power almost made the female dancers seem uncommitted in comparison. After this impression came to mind, however, I realized that the female dancers moving more full-out could have resulted in injury (from collision or otherwise) in the small stage space. Such is one necessary sacrifice for the intimacy of this type of performance setting. Another result of such a setting is that dancers must be super precise, because tiny flaws are more evident. These dancers rose to that challenge, offering utmost precision, although they could have shown more unified timing in some of the unison phrases. They matched the music to a T, however. 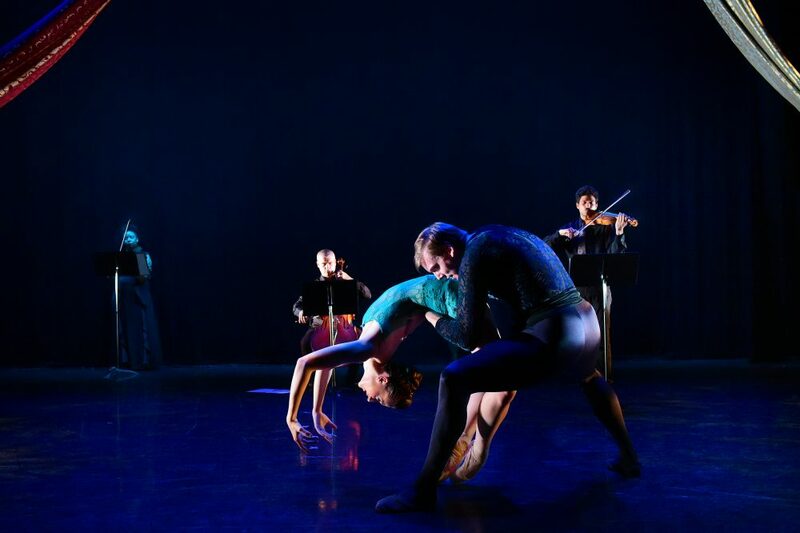 Annalise included interesting interactions between the music and movement (the former from composer Concetta Abbatte), as well, with the string musicians also right on stage with the dancers. 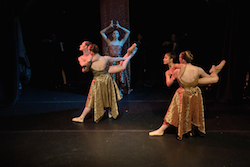 For example, while supported in the arms of another dancer, one beat her pointe shoes front and back to make a rhythm matching the music coming from behind her. The musicians got their own final bow, reinforcing that they were just as such central to the performance as the dancers. 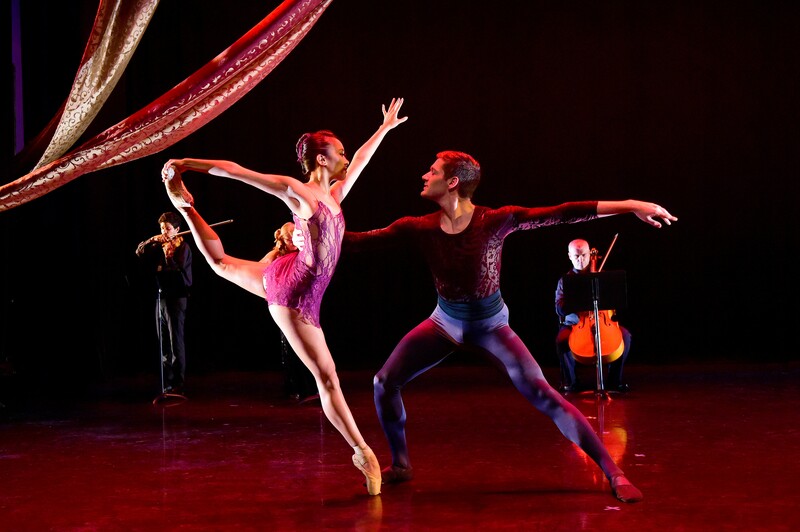 Music has been important to classical ballet since it beginnings. Arch Contemporary Ballet is taking that union to a whole new place, however. The subject ofChâteau, the courts and castles of the French nobility, was the nursery of ballet itself. The work honored that tradition with aspects of classical technique, yet brought it into the modern realm with contemporary movement and innovative supporting elements. Honoring the old, yet pushing it into the realities of the here-and-now — to me, that’s a valuable accomplishment that art can offer. In an age when many in our society are fed up with business-as-usual, some of which is inevitably here to stay, one might argue that such action is essential.